Get a signed BLACK PANTHER animated DVD by Reginald Hudlin! Get a signed MARIJUANA MAN poster by 5 time Grammy winner Ziggy Marley! Get a signed FRENEMY OF THE STATE comic book by PARKS AND REC and SOCIAL NETWORK star Rashida Jones! Get a signed 25 TO LIFE comic book by ER star Eriq LaSalle! Get a signed JUSTICE LEAGUE DVD and comic book from author Dwayne McDuffie! Get a signed BATMAN, BLACK PANTHER and QUESTION comic book by artist Denys Cowan! Get a signed copy of LUKE CAGE NOIR by authors Mike Benson & Eric Glass! Meet acclaimed sci fi authors STEVEN BARNES (LION’S BLOOD) and TANARARIVE DUE (MY SOUL TO KEEP). Meet all the other amazing special guests we’re not telling you about! Get your eat and drink on while the funky beats are playing! And best of all, admission to this historical event is FREE! 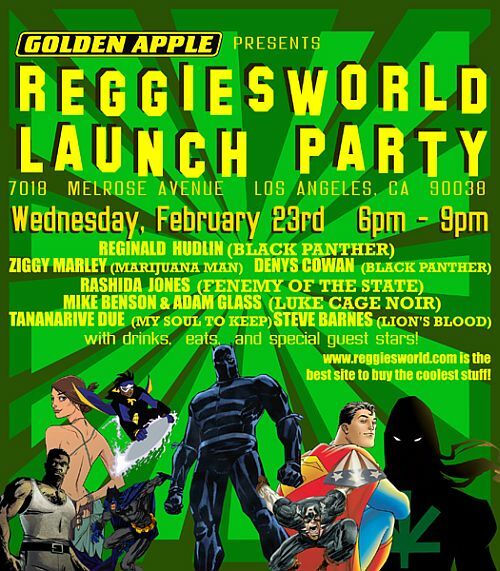 Celebrate the launch of www.reggiesworld.com, the best place to buy the coolest stuff! Golden Apple Comics is at 7018 Melrose Avenue, Los Angeles CA – cross street is LaBrea.